iBall was introduced for the first time in year 2001. The company is an Indian originated organization which is headquartered in Mumbai. The company started its carrier as the manufacturer of IT components including CPU cabinets, mice, keyboards, speakers, microphones, headphones, SMPS, monitors etc. the company has grown at a much faster pace and now it is counted in India’s leading gadget and computer component manufacturers. The introduction of Tablets from this company occurred in last few years and this has contributed in boosting up the heat in the industry of portable computers. Seeing the progress of the segment, company has introduced many cell phones also which has lead to garnish their sales figure. Within this line up the company has recently introduced another new smartphone which is targeted towards the budget smartphone buyers. 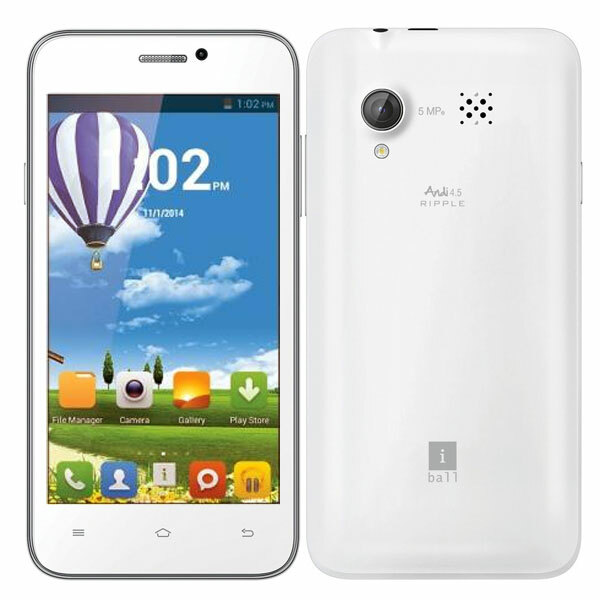 The iBall Andi 4.5 Ripple 3G is a budget range smartphone which is available in the option of 2G and 3G configuration. User can choose this as per requirement. The phone is available in a good processing speed which is clocked at 1.3 GHz and this is supported with a good RAM memory. The current era has raised the people’s choice and expectations towards gadgets and this smartphone amide them with its front and rear cameras and the introduction of latest android operating system. for every budget phone buyer, this phone demands a definite hand on.